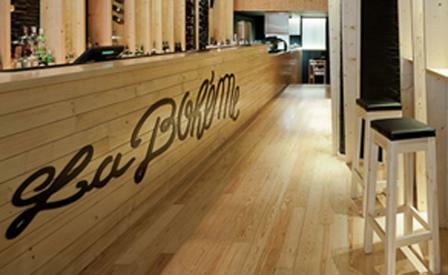 Natural, knotted pine beams and a wood-slat motif resembling a giant record cabinet delineate the two spaces at La Bohème, Porto’s newest – and possibly first - wine bar. Boss Paulo Dantas owns two music clubs in the city, which may have inspired the design by AVA Architects, but this place is really about the region’s world-famous wine and port. It’s served with tapas-sized portions of traditional Portuguese dishes like ‘caldo verde’ soup with potato and chorizo, and ‘alheira’ smoked-game sausage with lemon chutney. It’s no surprise the wonderfully raw space has a reliable soundtrack of alternative beats – and it doesn’t hurt that it’s around the corner from one of Porto’s most famous sights: Torre dos Clérigos.